The Testimonial widget is a great way to show all your users your loyalty by displaying other users’ comments, or quotes and polls regarding your product or service. It gives a nice image to your home or ‘Contact’ page. If you are selling a service or product, place this widget also on the purchase page. Also highly recomended on a landing page, it will help the users get a good impression of your professionalism. Title: The widget’s title to be shown above the testimonials. Add Item: A click on this button will add new items to edit. Click ‘Edit’ in every item’s row and an editing window will open, where you can enter the details. 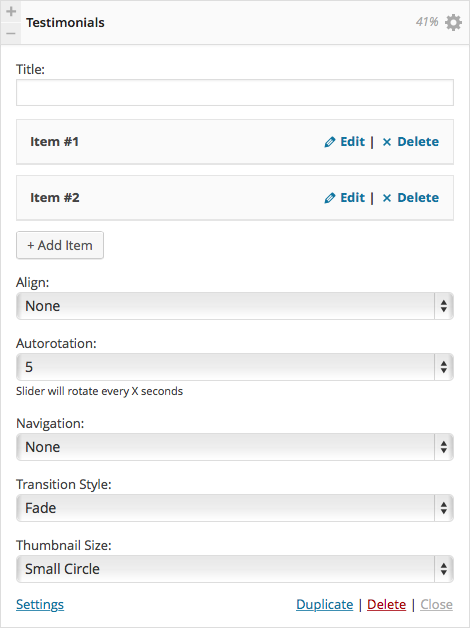 Align: Set the testimonial’s alignment to the page: None, right, left or center. Choose Image: You can upload an image from your computer or choose an image that already exists in the media library. Company / Subtitle Below Name: Place here the text that will be displayed under the company’s name. Link: You can add an URL to every testimonial. Link Text: Place here the text that will be shown as the link. Open Link In: You can choose whether the link will be opened in the same window or in a new tab. Content / Quote: Here you enter the actual customer’s / company’s content or quote.